Proulx Oil & Propane has been serving southern New Hampshire since 1944. They offer environmentally conscientious, cleaner burning oil and propane, plus the latest advances in the alternative energy market. Proulx's core goals have always remained the same; employ current technologies to more effectively market the company, maintain industry leading customer service, plus improve and streamline corporate productivity. At the initial development, CrystalVision advised implementing the project in a progression of phases that would allow Proulx to achieve objectives through easily manageable stages without disrupting regular business activities. The Proulx web site needed to fully encompass the extensive range of products and services available to residential, contractor and commercial customers. Plus, Proulx also wanted to include advanced functionality that would streamline and improve customer service activities while reducing operating costs. First, CrystalVision met with Proulx's management team. Representing the various departments within the company, they provided insight into each area's unique needs and desired goals. Launched in October 2003, the original web site provided a basic web presence with general information about the company and the products and services that are provided as well as a standard contact form for customer questions and inquiries. 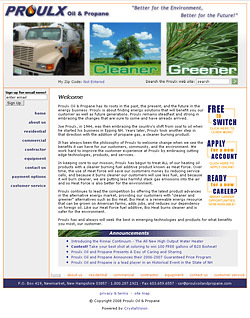 Subsequent phases integrated additional functionality, affording Proulx's customers more online service options, such as the ability to schedule deliveries and service calls, plus securely submit a "New Client" application and make real-time account payments, provide flexibility and ease of contact for Proulx's customers, while reducing overhead and processing time. In 2006, the Proulx web site saw the launch of a new design and user interface. Inspiring Proulx's off-line advertising, the design incorporates their "Cleaner. Greener." and "Better for the environment, better for the future." slogans, unifying a comprehensive marketing and branding strategy. At this re-design stage, secure web-based improvements to the customer payment functions were integrated. These provide customers even more flexible payment options and include the ability to pre-buy oil (as part of Proulx's "Guaranteed Price Protection Plan"), the ability to schedule automatic recurring account payments, or submit a one-time online check payment. A "Heat Calculator" was also added. Beneficial to customers planning their winter heating budgets in advance or those who pre-buy, the feature guides customers through a series of questions and provides an estimate of the number of gallons of propane the user might expect to use in one year. A full assessment of the individual department requirements and goals facilitated the smooth execution of customized solutions that allow the Proulx Oil & Propane company to increase customer service and expedite payment processing plus reduce costs, streamline corporate productivity and promote the Proulx brand.